Network Auto Body is a family-owned auto body repair facility with several locations in Southern California. Auto body shops require a lot of signage, and since all of their locations are driving distance from our shop in the San Fernando Valley, we’ve done signs for almost all of their locations. Most recently, they contacted us for a few different digital prints for different purposes. There were some replacement prints for existing valet style stands which we had originally made for them a few years back, tabletop signs which were smaller versions of the valet style stands, and retractable banners to list a few of Network Auto Body’s locations, along with a window graphic that we installed at their Glendale location to list contact information. Network Auto Body provides high-quality repairs and is one of the most advanced, environmentally-friendly auto body and paint repair centers in the industry. All of their shops use state-of-the-art equipment and PPG Envirobase Water Base Paint Mixing Systems which is the highest quality eco-friendly computerized painting system. They are the exclusive body shop for many different car dealerships in the Los Angeles area which makes them the top choice for many LA residents. They were even voted one of the Top 10 Auto Body Shops in the United States by Auto Body Network in both 2010 and 2011. As you can imagine, Network Auto Body frequently contacts us for many different types of signs. Auto body shops require anything from building signs to banners to help promote their business and advertise their services. A couple years back, we even wrapped a podium for them to advertise their business from the sidewalk. 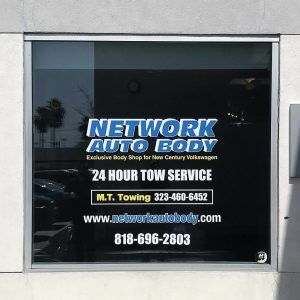 There is a lot of competition for auto shops in Los Angeles, so you want to use custom signs to help your business stand out from the competition. Call us today to get started on custom signs for your business!